If you’ve had any interest in trying out a DAMY Health program, do it now! There are only a few times a year you can grab a great deal on one of the plans, but they are few and far between. The reason I totally love her plans is because they are based on eating 100% real food. No supplements, no powders, no 100 calorie packs. Real food and serious workouts. I’ve done the Method plan, which taught me to love High Intensity Interval Training and even more so, strength exercises. Don’t wait until New Year’s Day, start living to your fullest potential now and enjoy the holidays, feeling healthy and bright! Flash DAMY Sale. Melt Off that Ice Cream! I’m on vacation, but I needed to stop and send a message! DAMY programs are 20% off this weekend. If you missed the last flash sale, don’t miss another. You have until July 9th at midnight to join DAMY and you’ll receive 20% off your program. Use one of the links below and use code HOTJULY to get going on creating a healthier you! For more information about the Bikini Body Program click here. For more information about the DAMY Method Program click here. Use coupon code: HOTJULY for your 20% off. You only have until July 9th! For those of you who visit Food It Forward to read my reviews of DAMY Health, today’s post is just for you! I still have a few posts you can find under the DAMY tab at the top of my homepage, if you are looking for more detail on the plan and what DAMY is. If you are thinking of joining, you are going to want to jump on board now. You have until Sunday, May 12th at midnight to join DAMY and you’ll receive 20% off your program. PLUS an entry into the SUMMER READY Challenge for your chance to win one of three $100 Lululemon Gift Certificates! This won’t happen again until next year, friends. Here’s my first go ’round with DAMY. I love the Method Program, but would love to try the Bikini Body later this year. Here’s what a difference 45 days on plan made for me. Apparently I carry a lot of weight in my eyelids???!! Use coupon code: JUMPSTART for your 20% off. You only have until May 12th! On the Road Again, just can’t wait to get that song out of my head again. We have seven weeks until our big road trip to Disneyland and I am vowing to be ready ahead of time. I hope, no I plan to have all my food prepared for the trip and frozen ahead of time if possible. One of the newest menu items for our trip? Chocolate Protein Baked Bagels. Let me give you a heads up before I continue on, these are not bagels folks. 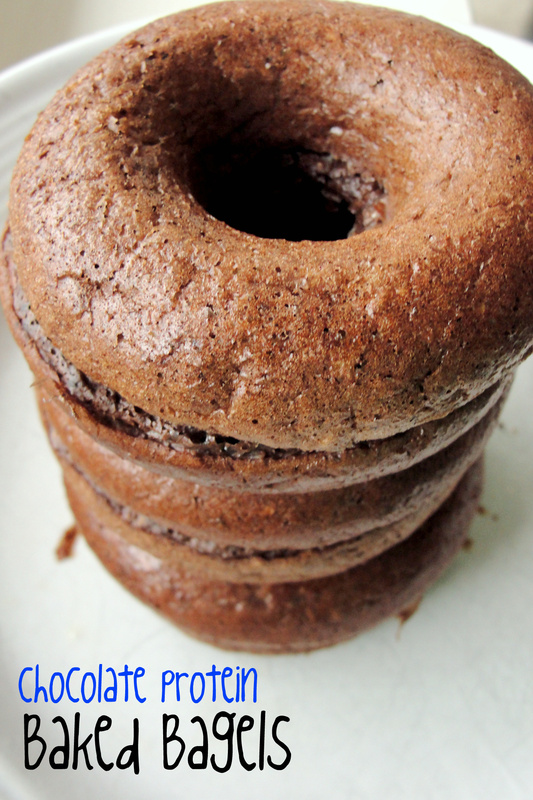 These are dense protein muffins baked in a donut pan. If you are looking for a 400 calorie bagel and cream cheese combo that will send your blood sugar soaring and then crashing, hit Noah’s Bagels (or your local equivalent). These are a substitute for those looking to stay satiated and keep the calories low and the fiber high. In other words, don’t serve this at your Easter brunch. This recipe comes again from DAMY Health. I mentioned that I wasn’t able to weigh myself or take measurements until day 15, which is today. Nervously, I stepped on the scale and was happily surprised with a 4.7 pound loss. Hurray! Only 0.3 pounds to go and I’ll have that supermodel body I’ve always wanted.Anyone wanna buy a bridge? I’ve lost 5 pounds before. It is usually with Weight Watchers and usually takes me a month to six weeks to get the first five off. What I am loving about this time around is how different I feel. Losing weight by eating clean and exercising more feels totally different from dropping pounds through Splenda induced lattes and 100 calorie cookie packs. It is kind of hard to get used to eating so much protein, but I ain’t arguing with the scale! I only made one recipe swap. Rather than smashed blueberries, I used applesauce. Well, I also used a donut pan. Two donut halves will make up one “bagel”. These taste really good with some whipped cream cheese in the middle too. If you want to use a light cream cheese and whip it yourself, you can really get more cheese for your calorie. This also gives you the option of adding flavor. My friend Jessica brought light cream cheesed mixed with stevia, Trader Joe’s Pumpkin Butter and uh…shoot…maybe something else, I’ll have to ask. Anyway, she brought it to share with fellow moms last week and it was amazing! Happy bagel baking! If you don’t have a bagel pan, you can buy one on Amazon for less than $10. DAMY Health has a blog with tons of tasty recipes, including the chocolate muffin recipe used to make these bagels. 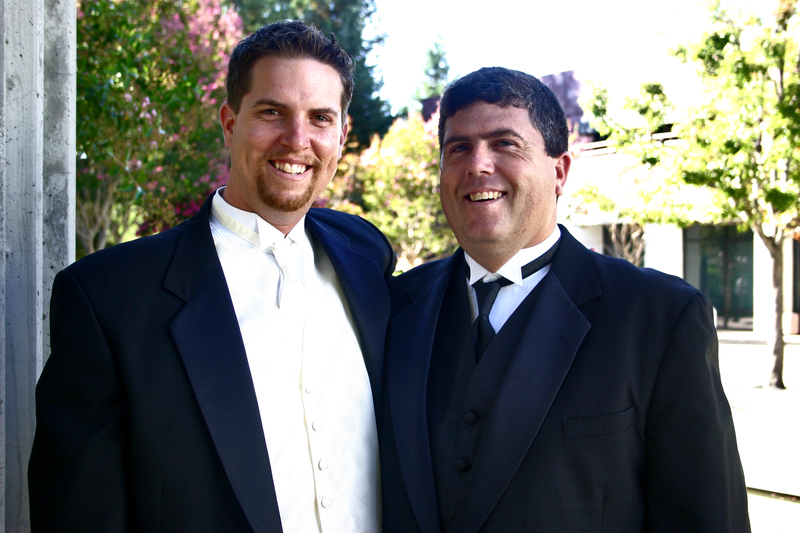 First off, Happy Birthday to my wonderful husband and best friend, Jy! I’m sure you have heard me say enough nice things about my husband, but he’s just really nice. He is a wonderful father and patient, caring and funny husband. Happy big 35, Jy! Jy with his older brother, Donald, Max’s (middle) namesake. To celebrate his big day, both of our boys got the stomach flu this week. Dallas is over it, but can’t shake the sick blues, so he hitched a ride to Grandpa’s house from preschool today. Max is also over the worst of it, so please pray for a peaceful evening for Jy! Today, I tried making one of the many cheesecake squares featured on the site DamyHealth.com. This recipe can be changed in a number of way, all of which seem delicious. Chocolate, strawberry and pecan are a few of the cheesecake recipes you can find on the DAMY website. Warning: if you choose to visit DAMY, plan to feel fat. Her recipes are great, but just going to her site will encourage you to get off your booty and start moving. I think that is a good thing. I used the “Healthy Lemon Coconut Cheesecake” recipe with a few changes. While I didn’t have any greek yogurt on hand, I did have Brown Cow Creme Top Maple. While the full fat yogurt added calories, it also added flavor and I didn’t need to use any honey. My pantry was also a bit shy of cashews, so around a quarter cup of chopped pecans went in the crust, too. I don’t know enough about Stevia to judge one way or another, but “apparently” the sweetener is natural and much better than Splenda. I’m sure I’ll find out that I’m wrong as soon as I post this. If you are interested in learning about clean eating, check out Tiffany’s wonderful site! While these squares don’t look like your typical cheesecake, I can promise you, the flavor is out of this world. I’ll have to try these again in the summer as a sweet, frozen treat. They take about ten minutes to whip together, too. Hope to see you tomorrow for another Oscar themed Movies & Munchies, Moneyball!